The inescapable truth is that nearly all the popular storable food products on the market today are loaded with chemicals and GMOs. If this is food that's supposed to keep you alive during a crisis, it makes no sense that it would be POISONING you at the same time, does it? As a longtime prepper myself, I store food for emergencies and unknown events that may be headed our way. But finding clean storable food has proven almost impossible. It seems like all the storable food companies -- including all the "big names" promoted across independent media -- keep using GMOs, MSG and other toxic ingredients because they're the cheapest ingredients available. In my quest to find storable foods good enough for my own personal use, I've rarely found anything organic, and I've never found anything that was laboratory tested for heavy metals. Before long, I realized the only way I was going to find something like this was to create it myself. It's called the Ranger Bucket Organic Emergency Storable Food Supply (certified organic! ), and it's the world's first emergency food supply to be laboratory verified: All the products it contains are organic, non-GMO, low heavy metals, pure and clean. Nothing else across the entire industry has been scrutinized like this product, which is why this is exactly what you really want in the aftermath of a hurricane, an earthquake, tornado, social chaos or even the outbreak of regional civil war. WHAT'S IN THE RANGER BUCKET? When times are tough, you need food that provides you with NUTRITION, not POISON! Food toxins, heavy metals and pesticides weaken your immune system and can even hurt your alertness and situational awareness. They promote diseases and lethargy, and they can often lead to diseases that require serious medical interventions (like diabetes or cancer!). But in times of crisis, you need to fully alert, with strong immune function, high physical stamina and outstanding health. Toxic GMO foods laced with pesticides can't give you that... only truly clean, nutritious food can deliver the performance you need in uncertain times. And the Ranger Bucket Organic Emergency Storable Food Supply delivers on that promise. COMES WITH ITS OWN CAMP STOVE, PARACORD BRACELET AND KNIFE (while supplies last). 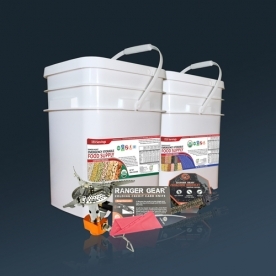 Much more than just ultra-clean organic storable food, the Ranger Bucket Organic Emergency Storable Food Supply also includes an assortment of mission critical Ranger Gear to help you prepare that food. For a limited time while supplies last, we are including all the following Ranger Gear tools inside the Ranger Bucket food supply! Just $249 plus FREE bonuses ($60 of value) while supplies last! The convenience of a paracord bracelet makes it a must-have preparedness tool, enabling you to carry several feet of paracord with you at all times, for use in an emergency and countless survival situations. Cook anything almost anywhere! 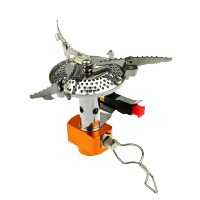 Works with propane and butane and you can use it to prepare all the foods in the Health Ranger Bucket Organic Emergency Storable Food Supply. 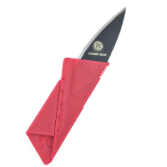 Foldable and ultra-portable, it doesn’t take up much space and is easy to carry anywhere. These three items, along with the Health Ranger Bucket Organic Emergency Storable Food Supply will have you fully prepared for whatever disaster comes your way. Order now to get prepared with healthy, nutritious food and take advantage of the FREE Ranger Gear gifts valued at over $60 (while supplies last). when every Ranger Bucket food supply while inventory lasts. Why Should YOU Have Organic Survival Food? Natural or man-made disasters can happen at any time, with no warning – your supply of organic emergency food should always be nearby. Tsunamis, hurricanes, droughts, earthquakes and other natural disasters can take you by surprise. Some, like solar flares or EMP weapon attacks, can even take down the power grid and leave you completely in the dark. The larger the disaster, the more time it takes for help to arrive, and in a truly catastrophic disaster, you are on your own! After clean water and shelter from extreme weather, organic emergency food is the most important things to have in a crisis. It keeps you fed, energized, alert and motivated. STARVATION IS YOUR ENEMY in any crisis. Any shortage in real nutrition immediately results in a greatly reduced chance of survival. You can't live on junk food! In every crisis we've seen over the last two decades, local people always loot convenience stores and end up living on Doritos and Pop-Tarts. This is a rapid path to disaster and death! Junk food might provide empty calories for a short while, but without the real nutrition that comes from nutrient-rich organic foods, your body will quickly run out of minerals and health-promoting nutrients... especially when you're enduring the stress of a crisis (which accelerates nutrient loss and mineral depletion). 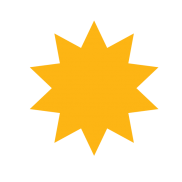 Why Choose The Ranger Bucket Emergency Storable Organic Food? Most other preparedness foods sold today are full of pesticides, heavy metals, MSG chemicals and GMOs that are DETRIMENTAL to your health. Most cheap brands of preparedness foods are also filled with salt and sugar – empty calories with almost no nutritional value. You can't live on refined white sugar and processed salt. You need REAL NUTRITION to stay alive, alert and adaptive to changing circumstances. Quality storable foods should keep you healthy and give you an energy and stamina boost, not sap your energy by making your body work extra hard to detox all the chemicals and heavy metals they contain. Remember: The demands on your body and mind will be AMPLIFIED in a crisis... you'll have to plan harder, work harder and potentially move faster and farther than you've ever had to before... all on LESS food than you usually eat. Therefore, your food has to deliver more nutrients per pound of food, meaning it must be high nutrient density ORGANIC foods. The Health Ranger Bucket Organic Emergency Storable Food Supply is the world’s first preparedness pail that has been meticulously laboratory tested for GMOs, MSGs, heavy metals and it has passed all these test with strict limits. This is the first storable food product I've ever put my name on, and I'm only willing to do that after extensive laboratory testing and validation (that other storable food companies totally ignore). Each food item in the pails is vacuum sealed using commercial vacuum equipment to prevent oxidation and ensure the nutrients are fully intact for long-term shelf life. The Health Ranger Bucket Organic Emergency Storable Food Supply is brimming with REAL FOOD NUTRIENTS in whole food form, all carefully selected to deliver the plant nutrients, proteins, minerals and fiber that you need on a daily basis. You can also prepare these ingredients in a multitude of different ways -- you're not limited to pre-packaged recipes of flavors. Prepare these foods in any way you wish! And some of them can be eaten right out of the bag! The Health Ranger Bucket Organic Emergency Storable Food Supply is the PERFECT BARTER ITEM in any crisis. 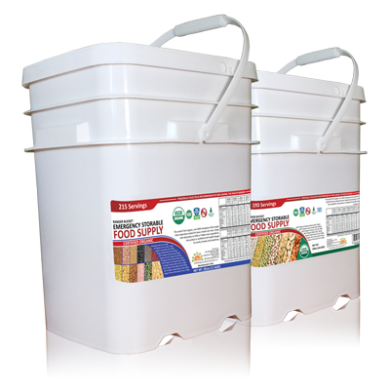 Organic storable food has almost unlimited valuable in a real crisis, and the rugged poly pails make these foods easily portable, resistance to damage, and easy to carry even by people who are smaller or have less physical strength. Although you should save this food to eat for yourself (and your family), in a pinch you can barter this food for almost anything: tools, shelter, gold coins, security services, safe passage, medicines or anything else of value. The ingredients in the Health Ranger Bucket Organic Emergency Storable Food Supply have been sourced from across the world, through carefully selected growers in order to make sure they are honest, ethical and CLEAN organic foods. This food contains absolutely no junk, no GMOs, no chemical excitotoxins (like MSG), no fillers, no maltodextrin, no soy, no refined sugars, no hydrogenated oils, no chemical preservatives and so on. This is honest, clean food that you can trust for your survival. Some foods require little (if any) preparation. Many can be eaten right out of their individually vacuum-sealed bags. Others may require simple reconstitution with water. A few of the items require boiling water for cooking. Great VALUE FOR YOUR MONEY. The Health Ranger Bucket Organic Emergency Storable Food Supply provides about as many food servings as many other brand-name "camping food" products that are laced with GMOs, pesticides and chemicals. You don't have to spend a fortune for really healthy food... you just need to choose the Health Ranger Bucket Organic Emergency Storable Food Supply. What does The Ranger Bucket Emergency Storable Organic Food Contain? WHAT CAN YOU MAKE WITH THIS FOOD? AMAZING MEALS! To really augment these storable foods (and stretch your food supply even further), you always have the option of adding olive oil, dairy cream, butter, animal meat, animal fat or bones to make even more delicious soups, stews and meals. This creates protein-rich, fat-rich meals that provide even more lasting energy for human metabolism, especially during a winter crisis. These meals can be as simple as adding lard (yes, lard!) to green lentils that are boiled with salt. In times of hunger and survival, that's a highly nutritious meal that can power your body and mind for many hours (if not days). Our salt isn't processed "white salt" either; it's Himalayan salt that's rich in the full spectrum of trace minerals found in ocean water. Nearly all popular storable food products use processed salt that's completely devoid of supporting trace minerals. As a result, white salt is unhealthy just like white sugar (or white bread). Remember that salt can also be used to cure meats, preserve foods (such as cucumbers that you want to pickle), and to replenish your own lost minerals after a hard day of physical work or travel on foot. 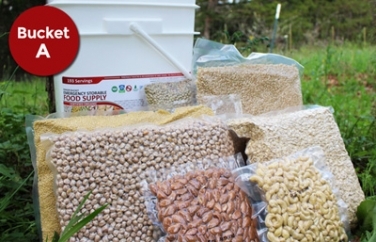 How Should You Store The Ranger Bucket Emergency Storable Organic Food? I firmly believe that emergency food should empower you with outstanding nutrition to keep you strong and healthy so you can survive almost any crisis. I personally guarantee that my Health Ranger Bucket Organic Emergency Storable Food Supply is meticulously sourced, strictly tested in our science laboratory, and safely packaged in our GMP-compliant, certified organic food facility where safety and sanitary conditions are paramount. I also guarantee that this food contains absolutely no added MSG, GMOs or other toxic ingredients, and that all heavy metals testing has met my strict limits described at LowHeavyMetalsVerified.org. Finally, I guarantee that you will find this food to be exactly what I describe here, honestly weighed and vacuum packed, meticulously tested using state-of-the-art laboratory science, and delivered to you fully intact and ready for storage. I back up this guarantee with a 100% satisfaction promise that says if you don't like this Health Ranger Bucket Organic Emergency Storable Food Supply for ANY reason -- including "Oh, I just changed my mind" -- you can return it anytime before 30 days for a full refund (minus shipping). I guarantee my storable food pails can help keep you nourished, awake, healthy and even ALIVE during times of extreme crisis! 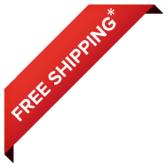 Order The Ranger Bucket Emergency Storable Organic Food NOW and get your FREE GIFTS. You just one click away from increasing your preparedness for almost any emergency situation!